When a train is approaching, all vehicles are required to stop within how many feet of the nearest rail of a railroad crossing? At a railroad crossing, you must stop within 15 to 50 feet if there is a posted stop sign, the electric signal is flashing, the crossing gate is lowered, a flagger issues a signal to stop, or a train is approaching and/or gives a warning. When following any vehicle at night, it is important to dim your headlights. Drivers should dim their headlights when following all vehicles, including motorcycles. Always dim your headlights when following a truck at night. Use your left foot to brake. Use your right foot for both braking and accelerating your vehicle. You should always brake abruptly to ensure stopping. Use your right foot for both braking and accelerating. You should apply the brakes gently with increasing pressure so that your vehicle stops gradually and smoothly. Apply the brake and hold it. Hold the steering wheel tightly and use the brakes lightly. If a tire suddenly blows out while you are driving, hold the steering wheel tightly and keep the vehicle going straight.You should slow down gradually, taking your foot off the gas pedal and using the brakes lightly. Do not stop on the road if at all possible. Pull off the road in a safe place. An orange sign means drivers should be alert, adjust their speed, and be prepared to stop if necessary. Orange is used for warning signs generally used in construction or maintenance areas. 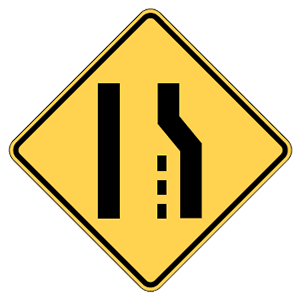 These signs alert a driver to possible dangers ahead due to construction and maintenance projects. 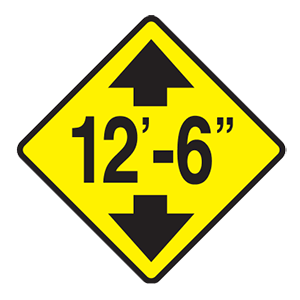 Drivers must slow down and proceed with caution when entering construction zones. A teen driver is allowed only two passengers under age 20 in the vehicle during the first 12 months of licensing. During the Initial Licensing Phase (for drivers ages 16 and 17), the number of a vehicle's passengers is limited to one person under age 20 for the first 12 months a driver has a license, unless the passenger(s) is/are a sibling, step-sibling, child, or stepchild of the driver. When experiencing a tire blowout, the driver should apply the brakes quickly and pull off the roadway to check the tire. If you experience a tire blowout, you should ease your foot off the gas pedal, keep a firm grasp on the steering wheel, pull safely off the roadway, and check the tires. You should not brake suddenly. A driver may pass another vehicle by driving on the shoulder of the road. Drivers are not allowed to leave the pavement or main-traveled portion of the road to pass another vehicle. Most rear-end collisions are caused by the vehicle in back following too closely. Following a vehicle too closely is the cause of most rear-end crashes. If you are involved in or come upon a traffic crash, you should stop your vehicle in a safe, well-lighted public place that does not obstruct traffic, if able to do so. If you are involved in or come upon a traffic crash, you should stop your vehicle in a safe, well-lit public place that does not obstruct traffic (if possible); help any injured persons (if necessary or if they ask you to); call 911 immediately; warn other drivers by using emergency flashers or flares (if available); and ask everyone involved for their names, addresses, phone numbers, driver license numbers, and license plate numbers.